Dr. Horrible (Neil Patrick Harris) is just your average lovelorn bad guy trying to make it big  he's got some dubious weapons, a secret hideout, a square-jawed nemesis (Nathan Fillion) and a video blog. Oh, and he sings. Think The Diaries of Lex Luthor as told by Rodgers and Hammerstein. Buffy the Vampire Slayer creator Joss Whedon conceived and produced the online video Dr. Horrible's Sing-Along Blog during the writers' strike. It's hard to imagine a studio green-lighting an idea as weird and ostensibly uncommercial as a 43-min., three-part online supervillain musical. 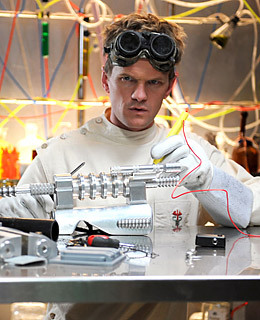 But in a medium that rewards the unconventional  the Web  Dr. Horrible was a hit. After its July debut, the series reached No. 1 on iTunes' video chart, with 2.2 million downloads a week. Now there's a sound track, Web comics and a dvd on the way. Cue the maniacal laughter.